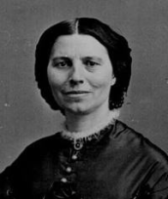 No list of famous nurses would be complete without including Clara Barton. Her name is synonymous with the American Red Cross, but she played a very important role in caring for the sick and wounded in the Civil War as well. In spite of a difficult childhood or perhaps because of it, she became a woman who felt very strongly about the welfare of others and was an important force in supplying the means for their care. Clarissa Harlowe Barton was born on Christmas Day, 1821, in Oxford, Massachusetts, the youngest of five children. Her father, a Revolutionary War veteran, was very active in the Universalist church. She remembers the church as being very stern, cold and devoid of comfort. Her mother was emotionally unstable with sudden periods of anger and rage, so her older sister, Dolly, cared for her. When Clara was six, Dolly had a mental breakdown, so once again, Clara lost a mother figure. Another sister took over her care, but because of her uncertain family life, Clara became very sensitive and shy. In spite of her many problems, Clara learned to make the best of her situation. Her sisters taught her to read at an early age and a brother taught her mathematics. At the age of eight, she was sent away to school. Even though she was advanced academically, she was socially immature and soon returned home. When Clara was 11, a family incident occurred that probably changed her entire life. Her brother was severely injured and not expected to live. For the next two years, Clara spent most of her waking hours nursing him back to health. After he recovered, she found that she became anxious and depressed because of the sense that no one needed her. This characteristic followed her throughout her life. After a long and varied career, she died of pneumonia in 1912 at the age of 90. By the time Clara was in her late teens, her family decided that she should teach school to combat her shyness. Even though the idea frightened her, she took a position at a district school and became quite successful. She taught for ten years before furthering her own education at the Clinton Liberal Institute in New York. After that, she started the first free public school in New Jersey. It was so successful that it was enlarged and additional teachers hired, but in spite of Clara's leadership, a man was brought in to head the school at a much greater salary than she was earning. Resentful and angry, she moved to Washington, D.C. While in Washington, Clara was hired as the first woman clerk in the patent office and paid as well as a man. However, she was not treated well and soon had an unrealistic workload that probably contributed to her becoming ill with malaria. After a period of recuperation, she returned to the patent office as a temporary employee with low pay but was satisfied because she believed she was paving the way for women in government. It was not until the Civil War that Barton found her true passion. Caring for the wounded and organizing the collection of food, supplies and clothing satisfied her need to help others. The time she worked for the government gave her contacts she needed, and her teaching experience gave her the structure to be an effective leader. She spent the early years of the war in Washington but later took supplies and tended the wounded in field hospitals. She preferred to be on the battlefield rather than in Washington hospitals or supply depots. After the war, President Lincoln assigned Clara the task of locating missing prisoners of war. When this work was completed, she embarked on a two-year speaking tour lecturing on Work and Incidents of Army Life. This provided income and caused her to be very well known throughout the United States. The American Red Cross is Clara Barton's legacy. Vacationing in Europe when the Franco-Prussian War started, she offered to help the International Red Cross that was formed by the Geneva Convention. Her leadership was so impressive that she was encouraged to organize the American Red Cross when she returned home. It seems as if her whole life led up to that moment. Ill health forced her to live as an invalid for three years after her return to the United States, but finally, in 1877, she was able to travel to Washington. After much work on her part, the Red Cross was finally formed in 1881. It was not without its problems and struggled for years to stay alive. Some of these problems were caused by Barton's unique personality and inefficient style of administration. However, in spite of the controversy surrounding the organization, for over 20 years it provided crucial services for many national emergencies. In 1893, Clara called a national convention and the Red Cross was reorganized and renamed the American National Red Cross. In 1900, she moved the headquarters from Washington to her own property in Glen Echo, Maryland and retained the presidency until 1904. Because of just one woman, Clarissa Barton, who needed to help people, the United States has a national organization that provides emergency and disaster relief whenever needed.